Situated in East Asia is the amazing country of South Korea. This nation, home to over 50 million residents, is a leading holiday destination. South Korea offers you a wonderful combination of nature, history and technological marvels. Top tourist attractions include Changdeokgung Palace in Seoul, Hallasan National Park in Jeju and Hwaseong Fortress in Suwon. Prepare for an exceptional vacation experience, because cheap flights to South Korea are now available for a limited time! South Korea’s capital, Seoul, is the home of Incheon International Airport (ICN), a 3-hour, 15-minute drive from the city centre. Indulge yourself with views that will rejuvenate your senses. 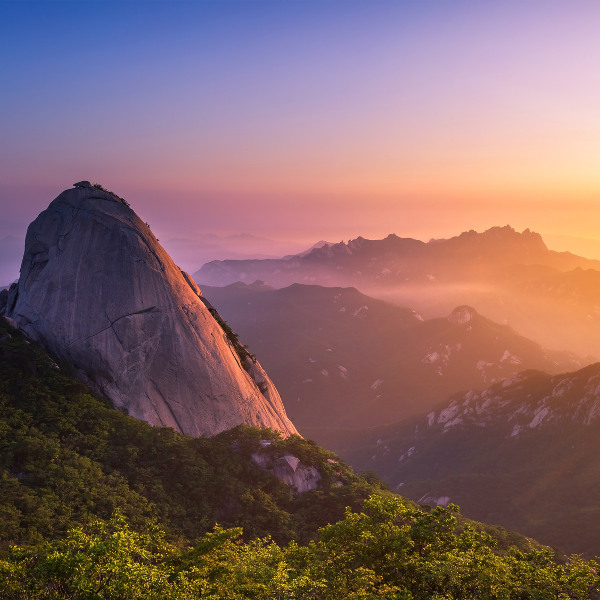 Explore South Korea’s range of parks, forests and mountains, with hiking trails through Ulsanbawi Rock in Sokcho, Hallasan Seongpanak on Jeju Island and Mireuksan Mountain in Tongyeong. South Korea, like many Asian destinations, boasts a wealth of history and culture. Get a glimpse into this nation’s past with a visit to its multitude of majestic temples and palaces, such as Gyeongbokgung Palace in Seoul and Beomeosa Temple in Busan. South Korea boasts some of the world’s most amazing beaches and islands, including one of the New7Wonders of Nature, Jeju Island. But that’s not all; soak up the sun at many other scenic locations, including Seonjaedo and Hongdong. The most popular time to visit South Korea is during spring (April – May) and autumn (September – November). The summer (June – August) does bring the warmest temperatures but also monsoon rains from July to August, along with typhoons. During spring, enjoy sights of the countryside as it transforms with the countless cherry blossom flowers in bloom. Autumn brings a change in hue, with reds and oranges dominating the environment. While these two seasons are the most beautiful, they bring the most tourists. Be prepared to share the attractions of South Korea with many other visitors and to book your hotel rooms well in advance. For cheaper hotel rates and fewer tourists, visit South Korea during winter (December – March). With the coldest temperatures comes the snow, showing another side to this nation’s beauty. Many of the points of interest will still be open with shorter queues. The snow additionally makes winter the perfect time to visit South Korea for some outdoor adventures like skiing and snowboarding. 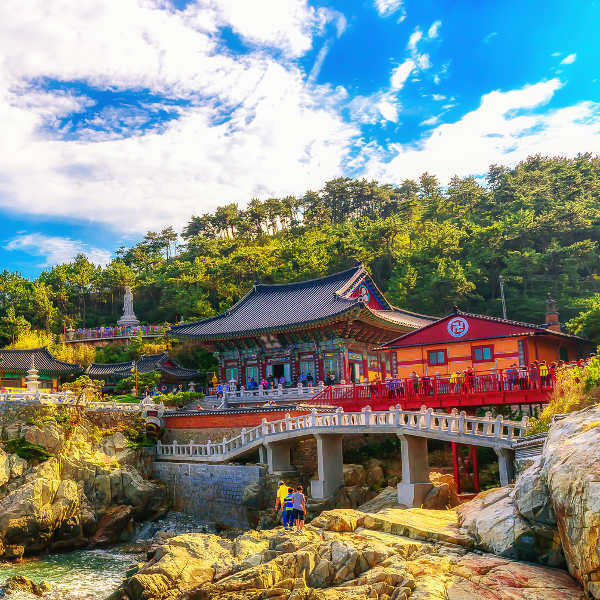 South Korea is an exceptional holiday destination to add to your bucket list. This is a country that boasts more than 5,000 years of culture and history, stunning landscapes and amazing technological marvels. Get ready to immerse yourself into this unique tourist scene in East Asia. The capital, Seoul, is the economic heart of the nation. It is renowned for its wonderfully reconstructed palaces and temples, such as Gyeongbokgung Palace and Bongeunsa Temple. What makes this city stand out even more is the futuristic attractions, and commercial hub that exists alongside these serene architectural marvels, including N Soul Tower, Lotte World and Myeongdong NANTA Theater. 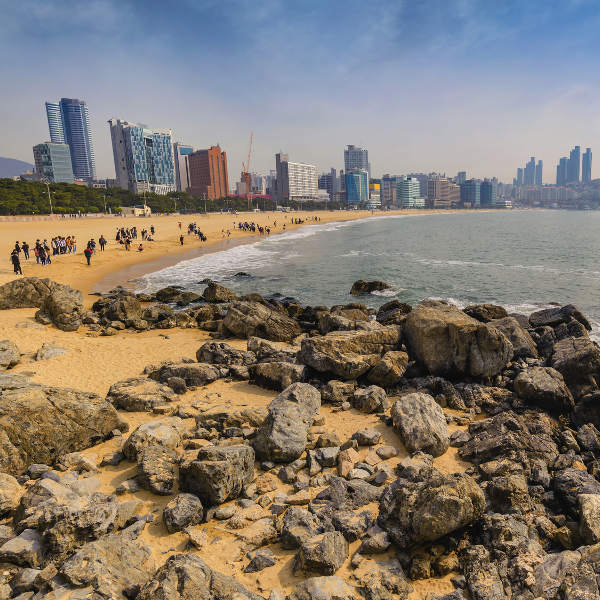 In Busan, discover scenic beaches, gorgeous nature reserves and a picturesque port. Like the capital, this destination is known for its technological attractions, while still doing an excellent job of retaining its old-city charm. Enjoy a more laid-back experience as you indulge in this city’s seaside lifestyle that is characterised by good food and friendly locals. For the classic island experience, visit the capital of the Jeju islands, Jeju City. Famously known as the ‘Island of the Gods’, it is a major tourist and honeymoon hotspot that includes delightful theme parks, day tours, parks and beaches. Treat yourself to its many attractions, that include Hallasan National Park and Jeju Kimnyoung Maze Park. Compare several airlines and book your cheap flights to South Korea online at Travelstart! South Korea is one of the safest countries in the world. You can even walk around at night in many of its major cities. In Seoul, political activists may stage protests near Gwanghamun, Yeouido and City Hall. These protests rarely get violent, but it would be best to avoid these areas when protests commence. Make sure to obey the local laws in South Korea. Ignorance of the law is not accepted as a reasonable excuse. In some cases, it may even give reason for harsher punishments. Drug offences can lead to heavy fines, jail time and immediate deportation.